Oh Spider-Man, why do you always play with my emotions like this? 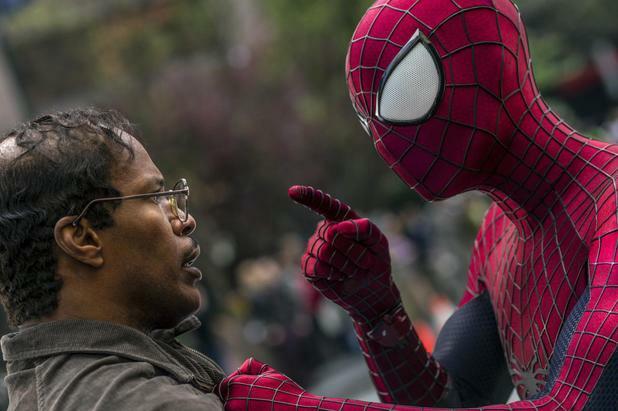 The Amazing Spider-Man 2 is a movie that didn’t need to exist, given that a perfect Spider-Man sequel already exists. Yet, here it is. While it is here, it might as well be loud, proud, and filled with search engine product placement. Picking up a bit after the first Amazing Spider-Man left off, The Amazing Spider-Man 2 finds Peter Parker (Andrew Garfield) on the day of his high school graduation. As always, he is late, because he has to chase a bunch of people through recognizable Manhattan landmarks before he can watch his girlfriend Gwen Stacy (Emma Stone) deliver her valedictorian speech. While Peter loves Gwen Stacy, he also knows that dating Spider-Man can be a dangerous thing. Of all of the different stories in The Amazing Spider-Man 2, the Gwen Stacy romance is probably the most interesting to watch. This makes it one of the few superhero movies where the romance is better than any of the action. I think that Garfield and Stone’s real life romance is partly to thank for the onscreen chemistry. On top of the romance, The Amazing Spider-Man 2 is a film told in three villains. Ever since I saw Iron Man 2, I have preached against the Multiple Villain Syndrome that plagues most superhero movies. Yet, no one seems to listen (probably time to yell more on Reddit). Each villain has their strengths and their flaws, but mostly they have flaws. Let’s start with Electro (Jamie Foxx). His alter ego, Max Dillon, is a nebbish Oscorp employee who is creepily obsessed with Spider-Man. I loved the start of that character, as it was weird enough to not belong in a big blockbuster. Then, he becomes Electro too quickly and any semblance of backstory is gone. Then, there is Harry Osbourne (Dane DeHaan), who becomes the Green Goblin. Harry and the Green Goblin are two of the most important characters in the Spider-Man universe, so it’s surprising that the movie barely gives them the proper introduction that they deserve. Despite the fact that the Amazing Spider-Man series is supposed to be a way to introduce Spider-Man to a new generation, you can’t really watch it without knowledge of the previous movies. Instead of a Harry backstory, The Amazing Spider-Man 2 decides to delve into the lives of Peter’s parents. Then, it does absolutely nothing with that information. The Amazing Spider-Man 2 has the power to do something great. Yet, it also wants none of the responsibility. The third villain is The Rhino (Paul Giamatti), who (spoiler alert? ), is barely in the movie. He is in there either to tease another movie I am not sure if I want to see, or to satisfy the needs of people who were dying to see Paul Giamatti do a cheesy Russian accent. It’s okay, Giamatti now has enough money to build a second pool or whatever movie stars do with their money. The biggest problem with The Amazing Spider-Man 2 is that it keeps throwing challenges at Spider-Man and never quite knows how to handle them. Usually, writers and directors should have a better handle on their characters. Now, Spider-Man always has a lot on his plate. This is what defines him as a hero. Spider-Man 2 basically explores these same grounds, but it understood which issues were actually important to both Peter Parker and Spider-Man. The Amazing Spider-Man 2 is the equivalent of watching four screenwriters (not an exaggeration) run circles around each other for 150 minutes. Throughout The Amazing Spider-Man 2 there are shades of what could have been, and ultimately there is disappointment at the mess that ended up on screen. Besides all that, I had a fun time. It did what a subpar superhero movie is supposed to do: it entertained at a moderately fun level. I just feel like at this point it is time that audiences started expecting something better. Don’t worry, there are no cranes in site this time around. The end scene might be one of the worst I have seen all year. It is a blatant attempt at pandering. It is like they were trying to put in a message that wasn’t built up to at all. Okay, now we can talk about Gwen Stacy’s death: This was handled very well in the film. If you’re a fan of the comics, then there were teasers throughout (Peter and Gwen on top of the bridge). In the movie, the death takes place in a clock tower, and the tragedy is handled in a tasteful way. Emma Stone was such a great part of these movies, and it is sad to see her go. Poor Spider-Man, he’s always accidentally killing the ones that he loves the most. I wish this ended with Peter standing by Gwen Stacy’s grave and then giving up on being Spider-Man. That would have been a much stronger cliffhanger than Paul Giamatti in a rhino costume. On that note, Peter’s deep struggle of whether or not to be Spider-Man seems trivial here, when it should have been a larger focus. Giving up the ability to swing across New York City with web launchers must not be an easy decision to make. Sally Field is a great Aunt May. Overall, she’s a great lady, too. When Electro blows out the power in the city, everybody immediately freaks out. Okay, blackouts are bad and cause chaos. However, things don’t immediately explode the second a city stops running. Calm down, Marc Webb. Take it easy with the faux-Queens accent, Andrew Garfield. Four writers. Four f***ing writers. Did they just let everybody at Sony have a say in this? So…how much longer until Guardians of the Galaxy comes out? This entry was posted in Uncategorized and tagged Dane DeHaan, Electro, Emma Stone, Gwen Stacy, Jamie Foxx, Marc Webb, Marvel, Movie Review, Paul Giamatti, Peter Parker, Spider-Man, The Amazing Spider-Man 2, The Rhino on May 7, 2014 by ian0592.